The Aleo LT-CD™ Series Volumetric LED Troffer delivers industry-leading performance with deep energy savings and continuous dimming. The precision-formed diffuser produces comfortable and pleasant illumination, enhancing productive spaces in various applications. Provides architectural aesthetics for retail, schools, offices, healthcare, and other various commercial applications . Simple construction with minimal parts allows for easy handling and installation. Low profile design optimizes shipping, storage, and handling. Luminaire features matte white durable finish. Integral T-Bar clips built into luminaire. Diffuser requires no additional frame or fastener for easy installation. Reflector systems features highly reflective coating and delivers balanced, comfortable illuminance for productive spaces. Diffuser lens reduces glare and improves occupant comfort while maintaining high efficiency emission. 7-year Limited Warranty. See warranty documentation for more information. 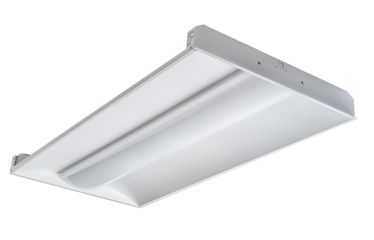 Luminaire utilizes high-efficacy LED packages maintained at cool temperatures for long life, high efficacy. Reliable driver features continuous dimming. Universal voltage (120-277V) for convenient installation. Comes equipped with luminaire quick-disconnect. Installs in most standard T-Bar ceiling grid systems. Flange kit available for hard-lid/drywall appplications. Surface-mount kit accessory available. Continuous dimming (0-10V) comes standard. Suitable for use with dimmers, sensors, daylight harvesting and other control strategies to achieve deeper energysavings and code compliance.